Antonio gives us another update from an exciting day of testimony at the Citizen Hearing on Disclosure. The day was mostly made up of international speakers and military witnesses. 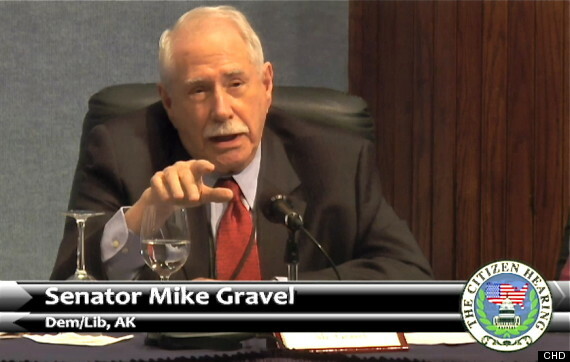 The evidence was so convincing that former senator Mike Gravel proposed that a resolution be drafted to get the UN involved with UFO research. He feels the UN is the best place for this sort of effort, given the UFO phenomenon is global in nature. Antonio says Gravel and former congress woman, Carolyn Kilpatrick, met with panelists to discuss the particulars after the hearings. Another hearing like this one, or whether it’s in the Congress, probably won’t advance our goals all that much. But there’s no reason why, with the various countries represented here — with the various scholars and military officers — that we wouldn’t try to, within our own communities, to get them to endorse a very simple, straightforward resolution, calling upon the [U.N.] General Assembly. I really think more Press should open up about UFOs and stop making fun of the subject. There so closed minded about the subject and really makes my blood boil. How can you not believe this ex CIA deathbed testimony is a lie. Whoever thinks this is all a lie should be ashamed of themselves. Truth be known would destabilize those in power. Religions would have to reconcile the belief in God and social values with their own fabricated dogma. But politically we would find our own politicians reluctant to part with their power as if they be benign aliens our only known form of biological systems called civilization would crumble for the worthlessness of money alien to aliens. If a threat then one wonders what deals have been made to use as as lab rats or seeds to keep those in power in power. We cannot even support truth or real rationale moral behavior now in our own leadership. So the threat must be to them and humanity as a whole. I hope that these hearings do result in something outside of the US. This subject has gone on far too long and needs some serious answers. I hope Openminds will keep all of us aware of what is going on with this in their search for answers.